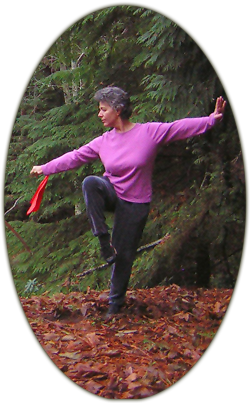 Thinking about what to put on this page as it may be the first impression you get of me, I wondered if I could say in a few short paragraphs, how much I love the art of Tai Chi and how my life has been changed because of my practice, my lessons and my teaching of it. So often I hear people tell me 'I would love to do tai chi'. I know this to be true. A lot of folks want to 'do' tai chi. It is my experience that of these people - very few of them want to actually learn tai chi. And there is a huge difference. Mostly because learning Tai Chi is hard. I have been learning Tai Chi since 1986 and it continues to keep my attention and although it is loads of fun, it is still hard. Yang Cheng Fu gave us his 10 important points. I like to use these as guidelines when I practice. One morning last week, I was exploring the point of seeking stillness. My body moved in comfort through the 108 form which is still such a puzzle for me even after 25 years, but my mind, my mind was anything but still. I watched a flock of birds sitting in stillness on a log in the sea near my home. The ocean was quiet, there was no breeze to speak of or to feel and as I moved it was my desire not to interrupt this quiet and still world. But my mind continued to jump around. I had heard the sad news recently of a student's death and the grief I was feeling was about as quiet as a storming sea. Inside and outside were not in harmony on that day's practice. Tai Chi is such a huge part of my life that I know a difficult practice is not a real concern - I'll have another experience tomorrow. And for that I am grateful. I am grateful to my teacher, Sam Masich for the lessons he has given and the path he blazes, always encouraging me to find my own way. Thank you John, Hansoo, and Prashanth, the guys at Arkion, for your help and encouragement with this web site. I am one of luckiest people in the world in that I am a Tai Chi teacher. I work with the best people doing the coolest work. I'd like to invite you to join me in the study of Internal arts. Put your seat belt on, relax your shoulders and welcome to my world.